This sweet 1966 AC Cobra, Shelby American work order #18051, was billed to Tasca Ford Sales, Inc. in East Providence. The car was delivered in the Spring of 1966 via the Cobra Caravan, a traveling promotional tour featuring examples of Shelby American cars. Edward Karedes (MA), the original owner, said he was at Tasca Ford when the Caravan pulled in and accepted the keys to his car directly from Carroll Shelby himself. It made it's way to Ontario, Canada; California; Florida; and is now back in Rhode Island. 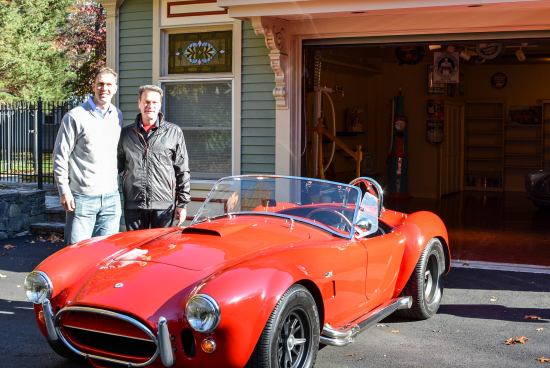 Here are Bob Tasca, Jr., and his son, Michael Tasca, admiring the Cobra. Bob Tasca, Sr., worked with famed race car designer Carroll Shelby and was very active in racing in the 1960s. Click here to learn more about this 1966 AC Cobra or get a listing of car properties in your favorite neighborhoods.